Exterior Associates specializes in complete kitchen remodels. Looking to upgrade the look and feel of your kitchen space? Exterior Associates can help you to plan the entire kitchen renovation. 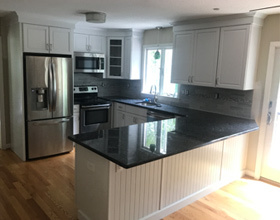 From choosing the style and color of your new cabinets to the material of your new countertops to the installation itself, Exterior Associates are the experts when it comes to kitchen remodels. Is your current bathroom old and outdated? 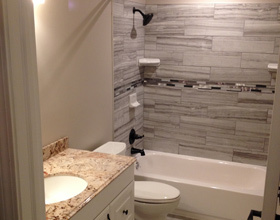 Let the experienced professionals at Exterior Associates handle the entire bathroom renovation. New tiles for the shower, new fixtures for the sink and tub and a new space saving vanity to help keep things organized. Our bathroom team will help you to design the bathroom of your dreams. Expand your outdoor living space with a custom built deck by Exterior Associates. We’ll help you design a layout with the space you need that’s within your budget. Give your interior a whole new look with some new flooring. Lots of styles and textures to choose from. A great investment to make in your home’s appearance. Adds value while being very low maintenance. Exterior Associates is proud to be a member of The Better Business Bureau and have worked hard to obtain an A+ rating. We are a trusted member of the Home Advisor family and have been given their Seal of Approval as one of their approved contractors in the State of Connecticut. Exterior Associates is a second generation privately owned company that specializes in providing high quality construction services. We are the installation contractors for kitchen installations and interior and exterior doors for eleven Home Depot Stores in the State of Connecticut. Learning the construction trade from their father and grandfather, who were both skilled carpenters and contractors, the Audet Brothers, Dennis, Nick and Jay along with cousin Dave Shaw, all became skilled tradesmen at an early age and all continue to ply their craft as they work to build the company today. These guys are the best! From small projects (storm door repair) to kitchen nook custom build to full additions, and most recently a fantastic living room transformation, there is NO ONE else I’d go to… I cannot thank you enough! Extremely impressed with Exterior Associates, especially Nick. They did an AMAZING job on my master bathroom. Even with a ton of questions and even concerns after the fact, Nick never made me feel like I was a pain and he addressed every concern above and beyond. Definitely plan on using them to finish our basement in the future. This is more than just a company slogan for Exterior Associates and their employees, it is a philosophy that has become the cornerstone of how of they approach each and every job and the type of service given to each and every customer.